Wheels is a 7-piece collection of mobile seating & tables designed to support an idea lab, where the spontaneous exchange of ideas fosters creativity.The designs take inspiration from Building 20, a structure erected on the MIT campus during WWII that was known as a “magical incubator” because of the fundamental advances in physics made there. As its name implies, Wheels is entirely mobile and was designed for flexible, on a whim, collaboration. a is entirely mobile. 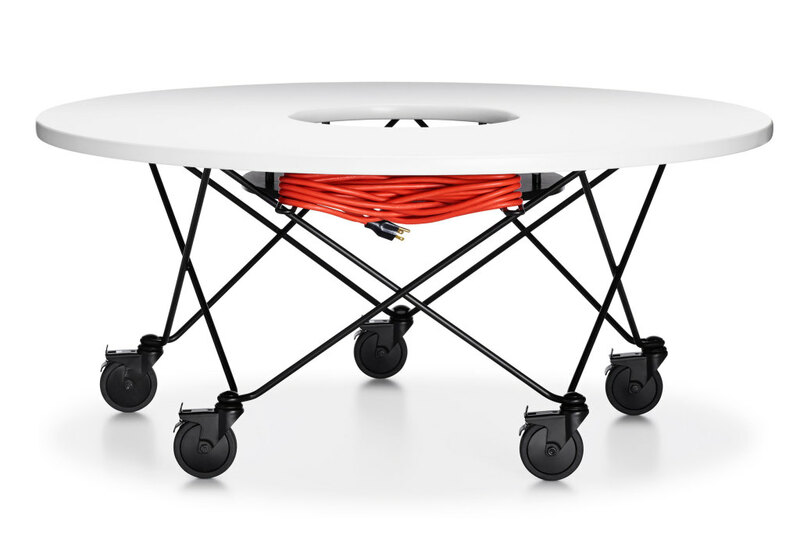 Every piece – chair, stool, chaise, idea divider, and tables – is equipped with large casters and built with light wire structures to make the collection movable in an instant. Rather than search for a place to collaborate when the creative energy erupts, participants can bring the furniture to the meeting place. Design is minimal, deceptively raw, with only essential elements included.